Mozilla released Firefox 10 today, including a major update that will make both developers as well as Firefox users happy -- default compatibility of almost all add-ons. Although default compatibility of add-ons will make a lot of people happy, this change is "prioritized as a P1 and part of achieving 'silent update'." as indicated in the feature tracking entry of "Add-ons Default to Compatible" in Mozilla Wiki. Description: Mozilla security researcher moz_bug_r_a4 reported that frame scripts bypass XPConnect security checks when calling untrusted objects. This allows for cross-site scripting (XSS) attacks through web pages and Firefox extensions. The fix enables the Script Security Manager (SSM) to force security checks on all frame scripts." The Release Notes include new and fixed features in version 10. The numerous Bug Fixes are in the link available in References. The upgrade to Firefox 10 will be offered through the browser update mechanism. However, as the upgrade includes a critical security update as well as many bug fixes, it is recommended that the update be applied as soon as possible. To get the update now, select Help, About Firefox, Check for Updates. Rogues (fake antivirus programs) have been around for many years. Members of the security community and people who have been on the Internet for a number of years will recall the various "SpyAxe", "SpyTrooper" and associated rogues in 2005 that we relied so heavily on the smitRem tool developed by "noahdfear" to remove. Over the years, the rogues have evolved, many with rootkit components. Just like clever phishing e-mails, the rogues are also very convincing with legitimate-looking windows as they attempt to convince people to fork over hard-earned money in order to "clean" the infected computer. Today, we are faced with not only rogues imitating Microsoft security software but also scammers telephoning unsuspecting people, attempting to obtain remote access to their computer. These scammers misrepresent themselves as calling on behalf of Microsoft or as Microsoft technicians. "Our consumer products, namely Microsoft Security Essentials, Safety Scanner and Windows Defender are available to all genuine Windows users for free. That's right – we offer these products at no cost! So please, do not enter your credit card details into a program that looks like one of ours, as this is most likely a rogue. We do not pop up on your screen every 30 seconds, minute, 90 seconds, etc. Rogues, however, will pester you and pester you until you either a) click OK and concede to buy their malicious program, or b) remove them once and for all with a reputable antivirus. Microsoft will never cold-call a user. Ever. If you receive one of these phone calls, hang up." Note: Never click on the rogue pop-up window. Even attempting to close the window by clicking the "X" will result in giving permission to continue with the installation. Instead, use the keyboard command Alt + F4 to close the window. Follow with an updated scan with your onboard antivirus software. "We will continue to fight the good fight, and do what we can to prevent the spread of malicious programs; but in the meantime, stay safe online, and think twice before handing over your credit card details to a third party you cannot verify – like one displaying pop-ups, or on the end of an unsolicited phone call." Read the full article on the MMPC Blog: When imitation isn’t a form of flattery. Data Privacy Day is an annual international celebration designed to promote awareness about privacy and education about best privacy practices. The 2012 international celebration of Data Privacy Day is scheduled for January 28. Why the concern about privacy? What may begin as a casual Facebook update or an innocuous tweet could easily come back to haunt you down the road. Unlike writing something on the bathroom wall, which can be easily painted over, what we do online is permanent. This includes status updates or comments on a friend's wall in Facebook, tweets, e-mail and online chats. All of these on-line activities contribute to your online reputation -- a reputation that can impact being accepted to the college or university of your choice or a future employment opportunity. Disclosing too much information online can also lead to identity theft, resulting in the loss of personal data, such as passwords, user names, banking information, or credit card numbers. Take steps now to protect your privacy. Don't share too much personal information online. Having your date of birth, address, where you went to school, mother's maiden name, and other personal information available to the public is the first step to identity theft. The public does not need to know every location you "check-in" to via your smart phone and neither do the burglars! Use caution accepting friend requests in social media venues such as Facebook. Just because someone sends a friend request, it is not necessary to accept it. Be certain the person is someone known to you. Parents need to monitor the online activities of their children. Take advantage of the helpful resources below which include information on privacy settings for Microsoft products and excellent advice from Sophos on Facebook privacy. A special person in my life is officially a teenager! Adobe released critical security updates addressing vulnerabilities in Adobe Reader and Adobe Acrobat. The vulnerabilities relate to memory and heap corruption vulnerabilities which could cause a crash and potentially allow an attacker to take control of the affected system. Acrobat and Reader users can update to the latest version using the built-in updater, by clicking “Help” and then “Check for Updates.” The Adobe Reader update for Windows is available from http://www.adobe.com/products/reader/. Even better is the FTP download site: ftp://ftp.adobe.com/pub/adobe/reader/win/10.x/10.1.2/ with no risk of add-ons. Microsoft released seven (7) security bulletins, one of which is rated Critical in severity, with the remaining six classified as Important. The bulletins address vulnerabilities in Microsoft Windows and Microsoft Developer Tools And Software. Most updates will require a restart to complete the installation. The security bulletin withdrawn last month after Microsoft discovered a compatibility issue between the bulletin-candidate addressing Security Advisory 2588513 and a major third-party vendor has been included in the release as MS12-006, "Vulnerability in SSL/TLS Could Allow Information Disclosure (2643584)". On Tuesday, January 10, 2012, Microsoft is planning to release seven (7) Security Bulletins, of which one bulletin is identified as Critical with the remaining as Important. Note from the Advance Notification that Bulletin 2, identified as Important addresses a "Security Feature Bypass" in Microsoft Windows. As indicated by the MSRC Blog, Security Feature Bypass (SFB) class issues cannot be leveraged by an attacker. It is explained that a would-be attacker would use such issues to facilitate use of another exploit. Further information is expected to be available in the SRD blog following the release of the update. Congratulations! 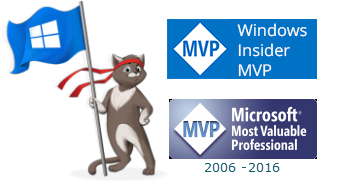 We are pleased to present you with the 2012 Microsoft® MVP Award! This award is given to exceptional technical community leaders who actively share their high quality, real world expertise with others. We appreciate your outstanding contributions in Consumer Security technical communities during the past year. Starting off the New Year with notice of being re-awarded as Microsoft® MVP is certainly a great way to begin the year! Wishing family, friends and Security Garden readers a happy and healthy 2012!